Sleek efficiency is in. That's why the next–generation TPC 7600 is no nonsense, all power. The new, strikingly re–designed mounted box boasts easier installation and more robust features, all at a significantly reduced size. Plus, it's priced at just under $1,199. The new box, which mounts on the truck, is one–third the size of the previous model, yet packs the same robust computing power and Windows 7 operating system. The new–generation unit also is more versatile. Its reduced size and high–sensitivity in–cab antenna design enables the unit to be installed in various locations in the front or back of the cab. Designed to survive for years in a less–than–delicate truck environment, the TPC 7600 was built with ultimate durability in mind. The unit can withstand high, long–term vibration and temperature extremes ranging from –30 to +60 degrees Celsius. The TPC 7600 is a fully compliant electronic on–board recorder that tracks and manages Hours of Service, with back–end monitoring via a web portal, two–way communication with the ability to send email attachments, on–board scanning and printing, in–cab video playback plus connectivity via cellular and Wi–Fi communications. It also supports Satellite communications via an optional module. Best of all, it's a brand your drivers already trust. Thinking the TPC 7600 belongs in your trucks? Have questions or need more information? Call us at 1–800–789–6277 or visit us at randmcnally.com/TPC7600. National Truck Driver Appreciation Week is right around the corner, and we’d like you to celebrate with us. As driver retention becomes a critical challenge, it’s increasingly important to show them a little love. That’s why we’ve created our Trucker Appreciation/Preferred Partner Program, and included an added bonus for you! It’s easy. When you sign up, drivers get 10% off IntelliRoute® TND™ 510 and 720 GPS units, Motor Carriers' Road Atlases and assorted GPS accessories — and you earn 5% from every purchase made! When you sign up, we’ll send you a personalized launch kit complete with a store front landing page on randmcnally.com, custom banners for your website, flyers to print, check inserts, emails to forward, and other driver communication, plus the Rand McNally partner seal. Encourage driver retention by offering a discount on the products they already know and trust, and use your 5% earnings as a revenue stream to fund new driver programs or existing projects. To enroll and get started, just give us a call at 1–800–789–6277. MileMaker® and IntelliRoute® software products are already a leading source of truck–specific routing, mileages and mapping among Fortune 500 shippers. Today, there's more. Rand McNally has released the latest software update, which includes updates to postal codes, toll costs and ZIPs. This includes 6,768 new postal codes associated with 699 unique community names, plus an additional 291 communities with lost postal codes that have been adjusted. An increase of 23% new codes since the last update. Includes addition of 95 new points and removal of 25 closed facilities, across the U.S. and Canada. As the only commercially available routing and mileage solution to offer both Household Goods (HHG) and Practical mileage and routing, MileMaker is already one–of–a–kind. With IntelliRoute, users get even more — a broader set of routing options including optimized, multi–stop address– to–address routing, hazardous materials routing and lowest–cost routing that optimizes toll road usage. 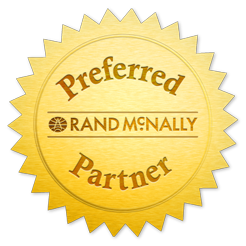 For more powerful client ROI, Rand McNally has integrated the software with more than 100 third–party applications. Large Scale Motor Carrier's Road Atlas is back!